Grey House Publishing launched its first directory The Directory of Mail Order Catalogs in 1981, the year it was founded by its President, Richard Gottlieb, and Publisher, Leslie Mackenzie. Since then Grey House has published over 200 titles, as well as countless annual or semi-annual editions of many of these directories and reference works that subscribers and libraries have come to rely as standards in their fields. The annual Directory of Mail Order Catalogs, for example, still enjoys a robust circulation over 30 years after its first edition. 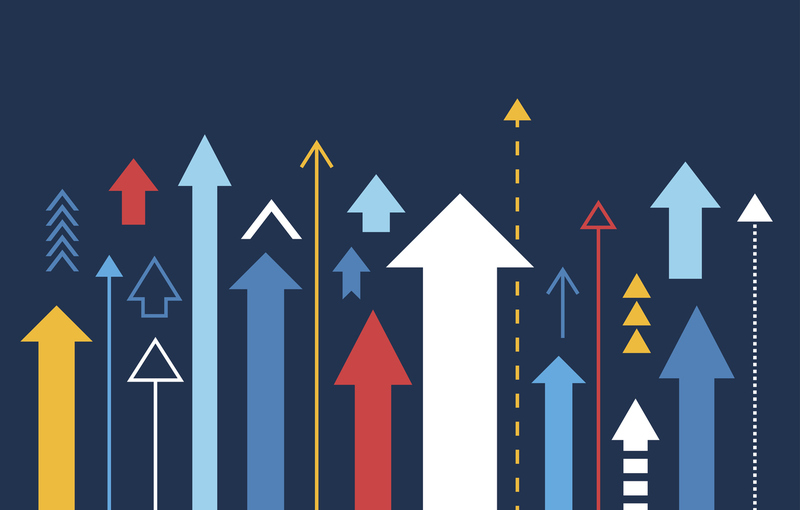 By the early '90s, three clear product lines began to emerge - Business, Health and Education. 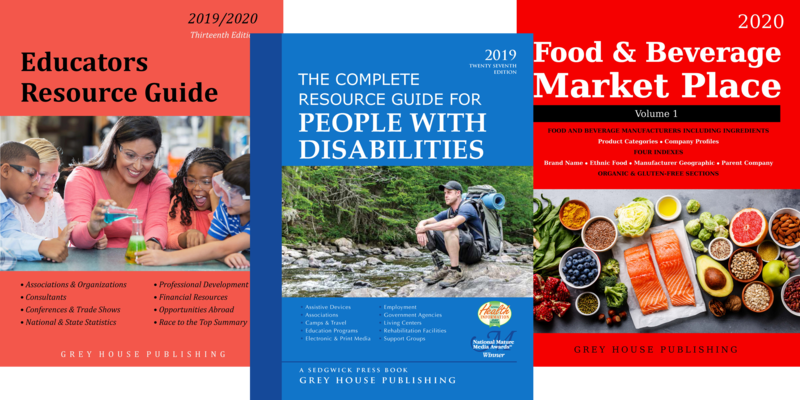 Each area soon had 8-10 titles, and with such well-known works as the 3-volume Food & Beverage Market Place, formerly the 100+ year old Thomas Food Industry Register, The Complete Resource Guide for People with Disabilities and Educators Resource Directory. Grey House acquired Universal Reference Publications in 1999 and Toucan Valley Publications in 2000, adding such highly regarded titles as America’s Top-Rated Cities, The Comparative Guide to American Suburbs, and Profiles of America. This helped launch another distinct product line - Statistics, Economics & Demographics. We added to the new line with The Value of the Dollar in 1999. This remarkably successful book combines economics with history and enjoys a wide circulation to this day across all high school, academic and public libraries. The Value of the Dollar's success helped move Grey House into the reference arena. In 2000 we launched the renowned Working Americans series with the first volume of what is now an eight volume set. Since then, we have added steadily to our reference line with such well-received encyclopedias as The Encyclopedia of Prisoners of War & Internment, From Suffrage to the Senate, The Religious Right: A Reference Handbook and Political Corruption in America. In addition, we explored the arts with our Performing Arts Directory, and a two volume encyclopedia on World Cultural Leaders of the 20th & 21st Centuries. In 2006, Grey House Publishing acquired the Micromedia/Proquest directory publishing group based in Toronto and Grey House Publishing Canada was launched. A Canadian company still based in Toronto, this outstanding group produces print and online versions of some of the largest and most important directories in Canada including the Canadian Almanac and Directory. Visit www.greyhouse.ca to find out more about our Canadian operation which expands every year. In addition we have joined in partnership with other information compilers to become the publisher of their print editions. We are pleased to be the publishers of the Bowker's Books In Print® Product Line, H.W. Wilson In Print, Salem Press, and Weiss Ratings. A few highlights include our new series: Opinions Throughout History, a new volume in the Working American Series: Politics & Politicians, a new edition of Political Corruption in America, and a new edition of Human Rights in the United States. There will be new annual editions on many of our standard titles this year including Sports Market Place, Food & Beverage Market Place and America's Top-Rated Cities. Grey House Publishing offers their directory data in fully searchable Online Databases. Varied search criteria allows for custom searches by Product Category, Geographic Area, Sales Volume, Keyword, Subject and more. 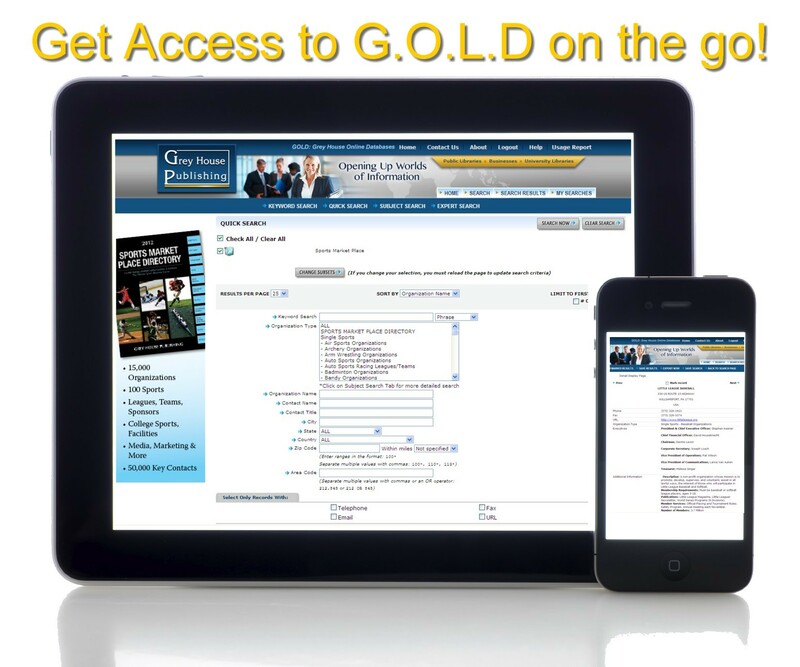 Visit https://gold.greyhouse.com for a free search of these Online Databases. Grey House is proud to announce that you can now get all of our content online in one place! You can now access your Grey House, Salem Press, new H.W. Wilson encyclopedia and The Reference Shelf titles all from https://online.salempress.com. To learn more about our various online databases and what they have to offer, check out the online database page.